Suzuki can take some time to get around to updating some of their most successful models but when they finally take the plunge they do a pretty good job. The 2012 update of the DL650 was a revelation way beyond what any of the marketing speak boasted. I wasn’t expecting much difference from my own heavily modified (forks/shock/Power Commander/Akrapovic) DL650 but by the end of my first run through Eildon-Jamieson Road I was floored at just how much better the updated machine was over the previous model. So this time around I had huge expectations for Suzuki’s long overdue revamp of the DL1000. I am happy to say I wasn’t disappointed. You could throw endless modifications and cash at the previous DL1000 and it still wouldn’t be half the machine Suzuki have served up for 2014. The heart and soul of any bike is the engine. While a dependable old mill, the previous motor was rough down low, couldn’t pull its standard gearing but redeemed itself through 4000-7000rpm before running out of puff. The new motor has oodles more bottom end torque, and now can actually pull that still too tall gearing effortlessly. And of course that comes from much more than the simple boost in capacity from 996cc to 1037cc. About the only thing left the same inside the crankcases is the timing chain. While the new crank, rods, pistons and heavier magneto no doubt all do their bit to help the new DL1000 to find that huge increase in smooth bottom end pull, the real magic happens inside the cylinder heads, injection and ignition systems. Each cylinder sports twin iridium spark plugs sparked independently by their own coils, thus each cylinder can fire its two plugs at different intervals to ensure the best ignition control dependent on RPM, throttle position and a myriad of other factors that would make your head spin. More accurate 10-hole injectors (up from four) timed in conjunction with oxygen sensors in the exhaust and air pressure sensors in the air-box, also do their bit to help the new DL1000 to what Suzuki claim is a 16 per cent improvement in fuel economy over its predecessor. And that’s an important point, as the new bike carries two-litres less, the tank capacity down from 22-litres to 20-litres. Suzuki claim 20.9km/L and best in class tank range. In the real world the DL1000 should provide a reliable 300km+ range in all conditions, while the more frugal may indeed cover 400km between fills. It’s essentially an all-new engine, and it feels it, despite the raw figures suggesting not that much has changed. Claimed peak power has only gone up by two per cent, registering 100bhp in the old scale. Likewise, peak torque has only marginally improved, from 101Nm to 103Nm but the real improvements can be found where you want them, down low and while surfing the mid-range between bends. Peak torque is now made at 4000rpm, an incredible 2400rpm earlier than the previous mill. The difference this makes on the road cannot be overstated, it really is chalk and cheese compared to its predecessor, which we rode back-to-back in NZ. At the other end of the scale, however, our new and still far from fully run in DL1000 seemed to run out of puff even earlier than the old bike. While it would rev past it’s claimed power peak of 8000rpm, there seemed very little purpose in pushing the bike past 6500rpm. The bigger capacity is the result of a larger bore and not a longer stroke so I can only put this down to the tightness of the engine. Still, it seems as though Suzuki have said, ‘right, for this type of bike the rider needs lots of low-mid range torque but doesn’t really need any more than 100hp’. Thus the engineers have simply not bothered to give it a top end that does the machine and its uprated chassis justice. If you are a rider that likes to short shift everywhere and run a higher gear through corners, or once up to speed leave your motorcycle in top gear, then the DL1000 engine will work beautifully for you. If you are a rider that likes to zing a motor through to the redline between bends, the DL1000 motor may disappointment. It will still get you over 200km/h, but that last 30km/h takes a while coming. Oh, and if you like pulling wheelies, even with the traction control turned off the DL1000 is not really a willing partner. While I can sit baby brother DL650 on the back wheel through four gears with consummate ease, the DL1000 just doesn’t want to play ball. When it comes to swapping cogs no rider could ever be disappointed with the gearbox on this machine. It’s about as perfect as shifting can get, rowing up or down the box it could not be faulted. 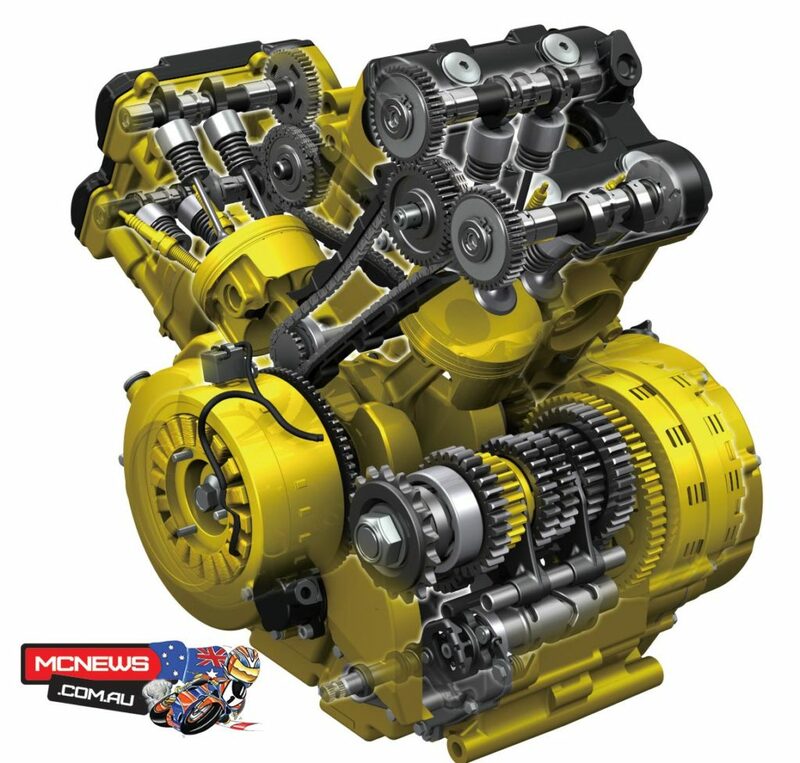 If you make the mistake of rushing down one too many cogs there is now a slipper clutch to allow for your blunder, ensuring the rear doesn’t get unruly. Clutch effort at the lever is also reduced. Internal and external gearing remains the same as before,’ apart from the new DL sporting a slightly shorter top gear. New 10-spoke Enkei rims are the same size as the previous machine, 19 x 2.5″ and 17 x 4″ and sport the same size rubber. The front axle diameter is up from 20mm to 25mm and the rear axle from 20mm to 28mm. One of the biggest improvements to the overall amenity of the machine stems from an unlikely source. The new 2-into-1 exhaust system saves 4.7kg over the previous 2-into-2 system, which is welcome, of course, and looks a damn sight better to boot. The real advance in getting rid of those two huge high-riding cannons becomes more obvious when it comes to strapping luggage to the back of the DL. When loaded with hard panniers, even the Suzuki branded ones, the previous machine had such a fat arse that it should have been fitted with a ‘Wide Load’ sticker. In fact, the width, when fitted with panniers, was such that it actually put the machine outside of ADR specifications. The comparatively lithe posterior of the new machine sports integrated pannier mounts attached neatly to the sub frame. This means no racks are required, and the panniers are positioned close to the centreline of the machine. Loaded with luggage, the previous DL1000 was a fair whale of a thing. The improvements in this area are massive, and thus as a loaded all-roads touring machine the new bike is far, far superior. Actually, when it comes to riding the machine fully loaded, I would say its in a different league altogether. It does have an active butterfly valve just before the muffler to reduce noise at lower speeds, read ‘to pass drive by noise regulations’, and sometimes I could feel this holding the machine back when getting hard on the throttle out of a turn. If taking a new DL1000 home for good I would work out a way to keep the valve open at all times. Actually, no, I wouldn’t, I would put an Akrapovic on it as soon as possible to let the machine really keep its lungs clear. The frame remains a twin-spar aluminium affair but thanks to improvements in production technology the new backbone is 13 per cent lighter while offering 33 per cent greater torsional rigidity. The new machine rides on a 20mm longer wheelbase despite the distance between the front axle and swing arm pivot being reduced by 6mm. The longer wheelbase coming from a 33mm longer swingarm, as is all the rage these days for improved traction and stability. I have never been one to automatically assume that just because a fork or shock comes with enough adjustment to tie yourself and your machine in knots, does it necessarily makes for better suspension. A case in point is Suzuki’s own recently revamped DL650, which, despite pedestrian looking low-rent underpinnings, is endowed with mountain road handling so good that is has to be experienced to be believed. The new DL1000 does have the substance to back up the specification sheet though and the 43mm KYB inverted forks are a huge improvement over the previous conventional Showa set-up. With a massive boost in outright braking power and response via the move to radial-mount four-piston callipers, up from low rent two-piston jobs on the old bike, it is a good job the forks are up to the task. The package works well together and the whole front end feels a couple of generations on from the old bike, which, of course, is exactly what it is. The rear suspension benefits from the larger swing arm and retains its predecessors handy wheel for easy adjustment of preload through 20 stages. Compression damping is also adjustable. 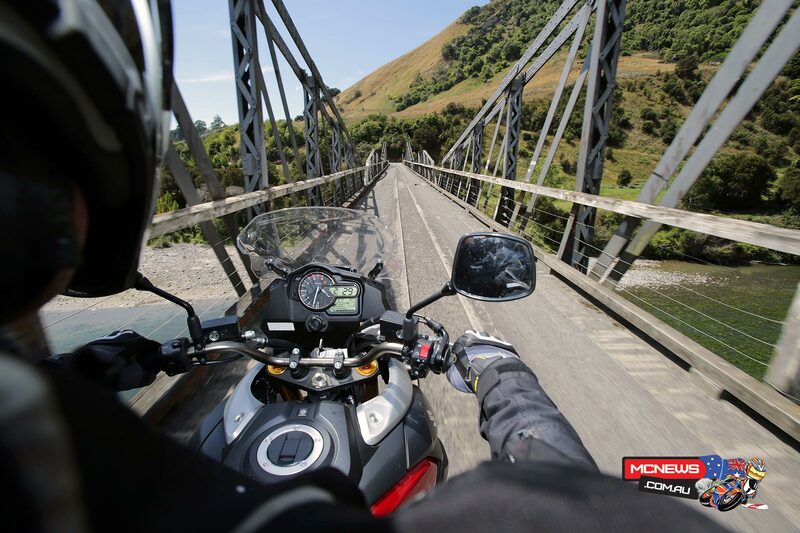 There is a much greater feeling of control through the whole stroke of the suspension front and rear that adds up to a much more satisfying ride in the mountains, but, like the change to the luggage mounting system, the benefits effectively double when you add the weight of luggage and a pillion into the equation. Suzuki has also fitted the new DL1000 with the latest generation ABS and traction control systems. With Suzuki having not employed traction control on any motorcycle before I must admit I feared it would be a crude and antiquated system. I was so, so glad to find the opposite. The traction control system is effective, can be switched through its two modes on the fly, from the bars, and is a useful safety aid if you are unlucky enough to encounter an unexpected patch of diesel or something similar. The traction control system can also be switched off on the fly, and the DL1000 is the only machine I know of that actually retains that off setting when the ignition is switched off in standard trim. (The latest BMW R 1200 GS does remember this setting with ignition off only when the ‘Enduro Pro’ plug is fitted). But Suzuki make no claims that the DL1000 is an off-road ready machine, in fact, Japanese HQ were stridently against Suzuki Australia and New Zealand allowing us to venture off-road at all on the launch of the machine. Thankfully their local operations live in the real world a little more than the powers that be inhabit. Still, and as much as I know how many DL1000 owners get up to some quite intrepid off-road shenanigans. I myself have climbed some serious mountains, traversed river crossings and waded through mud-filled bogs on the previous DL, it is clearly nowhere the best machine for that sort of task. It will do serious off-road work, but it will do it slower, feel a little more cumbersome and never really be quite as enjoyable in such environs as an adventure bike that has it’s roots in off-road riding. 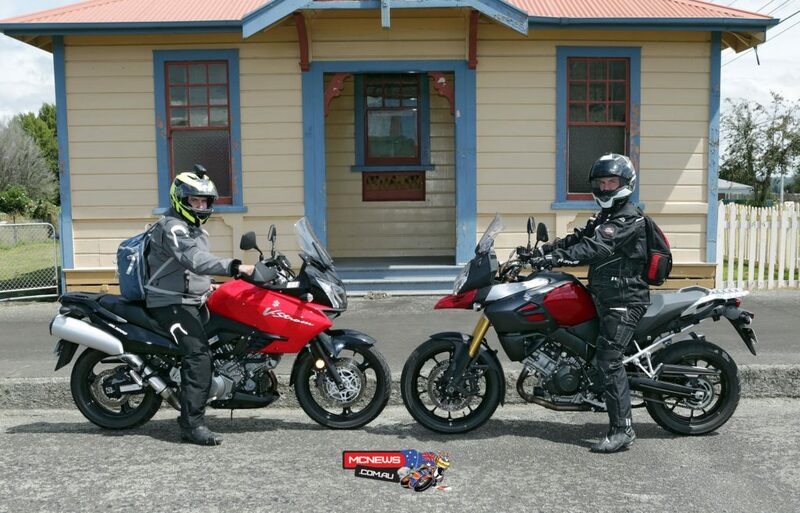 The DL1000 is more a Ducati Multistrada competitor or Triumph 1050 rival, it is not a comparable machine to a more off-road capable KTM 990/1190 or BMW R 1200 GS. The way the front mudguard is mounted on the new machine will also prevent any remotely serious adventure-touring rubber being fitted. I couldn’t even see a way where the front fender could be moved up to allow more clearance. It runs so close to even the standard tyre that when open fire road touring it will be a case of when, not if, the front guard gets smashed to pieces. However a new cooling system, which includes a water circuit through the oil pump area, negating the need for the previous machines low mounted oil cooler, does make the new DL a little more hardy in that regard. The DL has always been a veritable armchair when it comes to comfort, but Suzuki have gone to great lengths to provide even more room. The bars are 34mm closer to the rider, foot pegs 15mm more rearward to allow for more legroom. The tank is slimmer, the seat more sporting, more supportive. Everything about the riding position just feels, well, much more modern, and gives you a feeling of being aboard a much higher quality machine. An adjustable screen is also a handy addition and can be ratcheted through three angles while riding. I never encountered any real turbulence or buffeting. The screen can also be adjusted for height but that requires tools and a stop by the side of the road. A 12-volt auxiliary plug is also a useful standard inclusion. Likewise, every DL1000 comes with locks for panniers, even if you don’t buy the panniers and just make do with the excellent standard luggage rack. Thus, if you choose to add the factory luggage later on you already have the locks to key them alike to your ignition. Another nice touch. The new bike also scores a comprehensive trip computer along with volts, air-temperature and gear position indicators. High beam is 18 per cent brighter on the new bike. At 228kg (wet) the new DL tips the scales 8kg less than its predecessor. The difference feels even larger as despite a relatively tall 850mm seat height the bike manages to shrink around you somehow. It’s narrow dimension through the middle makes getting on and off the machine far easier than the seat height may suggest. On paper Suzuki now lays claim to the lightest machine in this class of motorcycle, just undercutting the latest BMW R 1200 GS, KTM 1190 Adventure, Ducati Multistrada, Triumph’s 1050S and Kawasaki’s Versys 1000. Overall, the new DL1000 is a huge improvement. The handling, suspension, bottom and mid-range torque, and ability to carry luggage without turning into a boat are all far above its predecessor. Ideally I would have liked some more top end power, and a little more thought put into the off-road ability of the machine. But the majority of DL1000 buyers won’t give two hoots about either of those things, and will just enjoy a capable, enjoyable and at $15,490 (plus on roads) affordable all-rounder that is one of the most nicely finished machines Suzuki has ever turned out. The ongoing cost of ownership has also been improved with the new DL1000 requiring minor services only every 12,000km, while the more expensive 24,000km services also recommend valve checks and spark plug replacement. Oh, I forgot to mention, it also looks so, so much nicer than its predecessor. 12 years is a long time between updates but the wait has been worthwhile. View from on top fully loaded with accessories. It is obvious here how much tighter to the centreline the panniers sit than before. They stick out no wider than the rider’s hips/knees. Click to open Accessory Gallery.